Arlington National Cemetery is America's most treasured national burial ground, steeped in history and the site of many of our most solemn national memories. Much has transpired for America in the last eight years since the 2nd edition of this definitive guide. This revised 3rd edition provides complete coverage of this remarkable shrine, reflects recent events, and offers new material on: People - Chief Justice William Rhenquist, Tuskegee Airmen, Iraqi War causalities, and the Columbia Shuttle astronauts; Monuments - September 11 Memorial, Air Force Memorial, 3rd Infantry & 4th Infantry Memorials, and numerous trees designated as Living Monuments; and, Visitors Guide - Burial Regulations and Religious Symbols. Also included in this title are several new photographs featuring new memorials - for example, the Correspondents Memorial and Columbarium - plus updated maps. 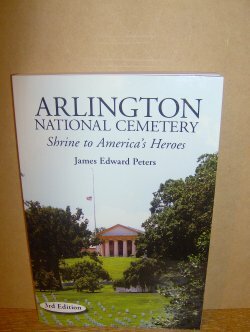 Written in close co-operation with cemetery staff, the National Park Service, and Arlington House, this comprehensive guide to this cherished place, where lie both the famous - admirals, generals, presidents, Supreme Court justices, and astronauts; and the not-so-famous - enlisted men, nurses, and unknown slaves. Peters details the history of the cemetery's inception and development and presents over 100 biographies of some of the most celebrated people buried there. Enjoy this terrific guide for its coverage of unique and important aspects of American history, or use it to prepare for a trip to Arlington National Cemetery and orient yourself while there. 359pp.